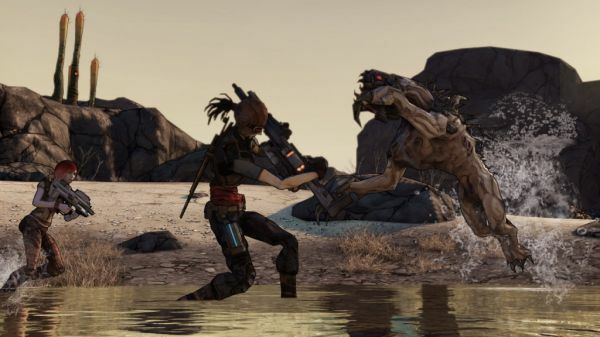 Borderlands, the four player co-op RPS from Gearbox, has had a long and arduous struggle to release. The game was announced in 2007 with a mid 2008 release date, but later pushed to mid 2009. Now the game is finally settling on October 20th, 2009 release date on the Xbox 360, PlayStation 3 and PC. The game completely revamped its visual style quite late into development, overall everything appears to be coming together quite nicely. You may have noticed we used the term RPS above. RPS stands for role playing shooter, and it's sort of a term that Randy Pitchford, Gearbox President, coined at E3 this year. I think you guys are calling it a “role-playing shooter,” or an RPS. Fallout 3 probably falls into the same category, though I think it relies a bit more heavily on the Role-Playing and a little less on the shooter. The interview with Destructoid continues on to talk about a few other aspects of the game including the size of the game world, the game's story, presentation and the weapons. All 600,000 of them. From what I understand there’s an AI system you guys designed that developed these weapons? Yeah, there are literally millions and millions of guns in Borderlands, more guns than we could have built. I mean, there’s more guns in Borderlands than all of the first-person shooters on the 360 and all the shooters on the PlayStation added together. And if you took all the development teams and said, “Make guns the way you used to make them,” you couldn’t make that many guns. So what we did instead was, instead of trying to do that -- which would have been an impossible task -- we wrote artificial intelligence software and a gear builder system that actually built the guns for us. And we created all of these manufacturers and all of these materials, like metals and plastics and all kinds of different materials, and all of these components of weapons and all of these classes of weapons. And then manufacturers have their own styles. We fed this all into our software and our A.I., and let that build the guns for us. It’s pretty wild stuff, man, and I don’t think anyone’s ever tried that. We’ve got some really smart folks on the software development team that worked all that out. It blows my mind every day, man. Everyday I’m discovering things I’ve never seen before.